The Teaching and Research Staff Service of the University of Málaga may issue certificates related to the curriculum of the teaching and research staff appearing in their academic records. To make your request, fill out and send this form as an attachment to certificados@uma.es, or via fax 952133482. In the aforementioned form, we have included the most demanded certicates; however, if none of these correspond to your request, you may indicate the information you wish the certificate to include as well as the form of delivery of such certificate. The processing time is usually short and everyone, including those who did not select the option of e-mail as the form of delivery, will be notified via e-mail about the termination of such process. 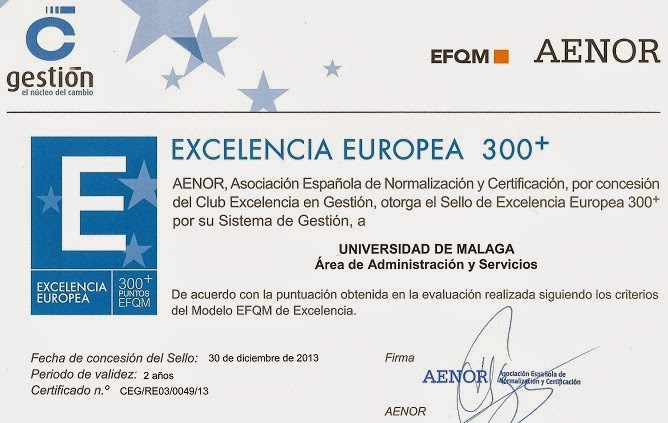 The name given in the form to the different types of certificates usually coincides with their very nature: exemption from fees, international adoption, school or kindergarten; or with the information it certifies: recognised teaching merits (Quinquenium), recognised research periods (Sexenium), prior service (Annex I), links with the University of Málaga. Thus, we will only further explain two types of certicate. 1. Service Sheet. Its usual purpose is to certify the information contained in the administrative record, so as to issue accreditations, sexeniums, regionally recognised service periods, participation in selection procedures. * Contract Teachers: positions held, regionally recognised service periods, if applicable, and institutional posts filled. * Civil Servant Staff: positions held and teaching bodies to which they have belonged, and, where applicable, quinquenium, sexennium, and regionally recognised service periods. Each form comprises three sections related to the Service Sheet, depending on its use; therefore, for the purpose of a correct processing, applicants must take care to indicate the appropriate use. 2. Active Service. As indicated by its name, this document certifies an active status. Standard use: Benefit from university services in those cases in which this type of information about the person concerned is not available. A form has been drawn up to apply for the Service Sheet in order to take part in the call for recognition of research periods (sexenium). The call is announced at the end of each year, usually in December, in the Spanish Official Gazette. Click here. If you require any further information, call 952 13 65 81. /cms/secciones/ajax/insertar_seccion/ /cms/secciones/ajax/borrar_seccion/ /cms/secciones/ajax/editar_seccion/ /cms/secciones/ajax/mover_seccion/ Are you sure you want to delete this section? 4035 You are about to cancel the edition. All your changes will be lost. Do you want to cancel and lost your changes?